Saturn's moon Tethys, with its stark white icy surface, peeps out from behind the larger, hazy, colorful Titan in this view of the two moons obtained by NASA's Cassini spacecraft. Saturn's rings lie between the two. 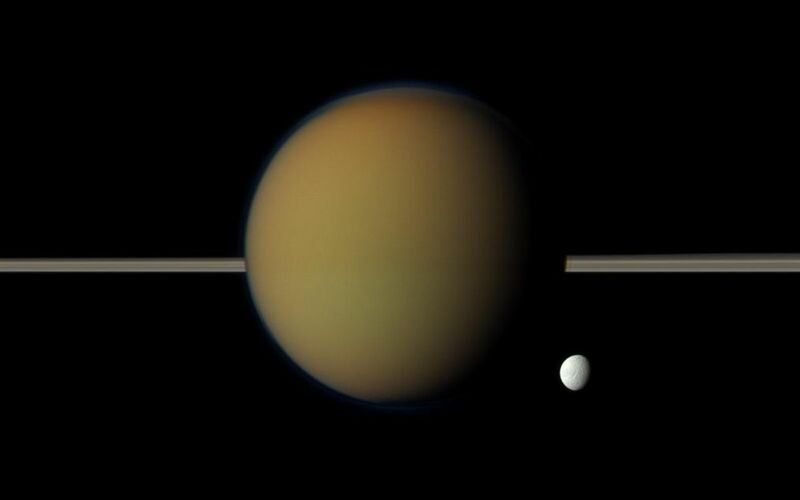 The north polar hood can be seen on Titan appearing as a detached layer at the top of the moon here. See PIA08137 and PIA09739 to learn more about Titan's atmosphere and the north polar hood. Ithaca Chasma, a long series of scarps or cliffs on Tethys, can be seen faintly running north-south on that moon. See PIA10460 to learn more. This view looks toward the side of Titan (3,200 miles or 5,150 kilometers across) facing away from Saturn and the side of Tethys (660 miles or 1,062 kilometers across) facing Saturn. This view looks toward the northern, sunlit side of the rings from just above the ring plane. Images taken using red, green and blue spectral filters were combined to create this natural color view. 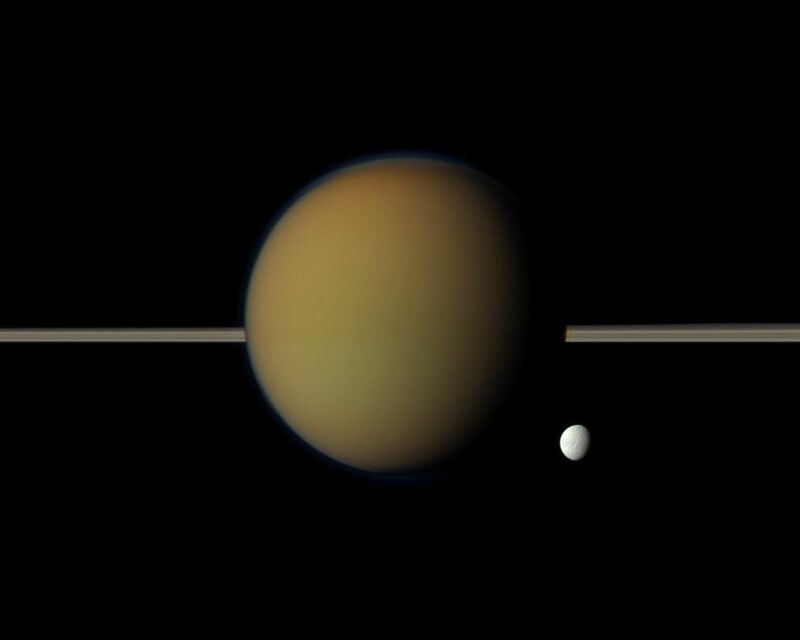 The images were acquired with the Cassini spacecraft narrow-angle camera on May 21, 2011, at a distance of approximately 1.4 million miles (2.3 million kilometers) from Titan and 2.4 million miles (3.8 million kilometers) from Tethys. 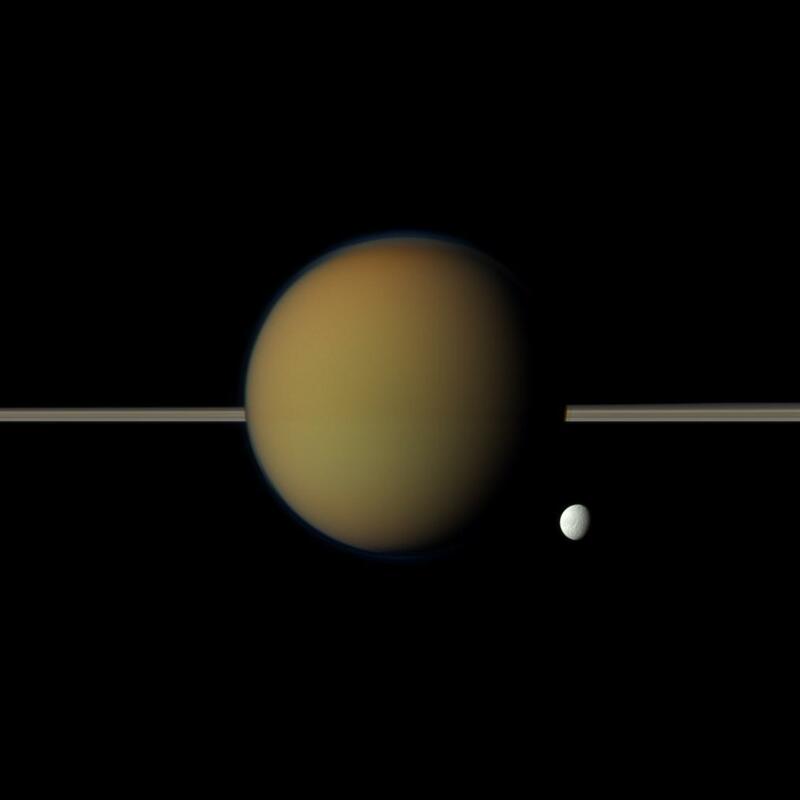 Image scale is 9 miles (14 kilometers) per pixel on Titan and 18 miles (27 kilometers) per pixel on Tethys.